Teacher shortage? What teacher shortage? Recent national reports indicate that the U.S. faces teacher shortages of hundreds of thousands a year over the next decade. But is New York State experiencing a widespread teacher shortage, or is the shortage restricted to certain geographic areas and hard-to-staff subjects? 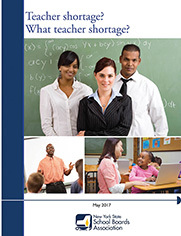 NYSSBA analyzed three separate data sources to determine the extent of the teacher shortage in New York.